You cannot start or end on just any day because the boat to our island only goes two days a week. Be sure you understand when the package you want begins and ends so that you don’t buy air tickets on the wrong days to make it work. We offer two week-long packages and each have a first-half and second-half you can choose separately. Why don’t you offer the Adventure Island at Glover’s Reef Half-Week options every week? Half-weeks are not offered during holidays to maximize the limited space on our island. Our Belize one week island itinerary is our most popular Belize package. Do I really need to fly in a day early as recommended on your “Our Hints For a Better Vacation” sheet? Most of our guests arriving Day 1 of their trip do not experience any problems getting there, however, there is a percentage that do. There are not many flights to Belize, so if you miss your flight you will arrive a full 24 hours later than you originally intended. Arriving one day early is the best way to avoid any problems in meeting the group on time. If you do plan to extend your stay by several days, we recommend you extend it before your trip with us, rather than after. Our Hints for a Better Vacation can be found else where on our site, and provides valuable information for planning your flight schedule. Learn about all flight options to Belize elsewhere on our site. To read our recommendations of what to do with your extra day, visit our Things to Do in Belize page. Why do we have to spend 2 nights in Belize City for the Adventure Island trip? Our boat ride is 3 hours one way. The boat generally leaves around 8 or 9 a.m., arriving on the island just before lunch. The unload and reload for the departing guests takes 2 hours, and then the boat returns to Belize City. If a storm is coming, we may leave as early as 6 a.m., to get the other group off the island before it hits. So you have to be right there with our group the night before, you can’t arrive that morning. On the end of the trip, you usually get back to Belize City about 4 p.m., although there is no guarantee, there are too many factors we can’t control that could make us arrive later. Therefore you can’t fly out that night, so you need a place to stay in Belize City. Therefore every package includes the first and last night in Belize City. The 5-night package is 2 nights in Belize City, 3 on the island; the 6-night package is 2 in Belize City, 4 on the island; the 9-night package is 2 in Belize City, 7 on the island. There’s no getting around that schedule. For an even more thorough explanation on this topic, read our blog post Just how remote is the island? Can we skip the orientation programs in order to have more time for diving (or kiteboarding, or surfing, or…)? For any sport you want to do, you must complete the orientation session. This is a safety issue. The sessions are not boring, nor a waste of time. We’ve been doing it a long time, and have developed our program as the fastest way to get a whole group up and running. Everyone is required to do the snorkel orientation the first afternoon on the island and the Belize sea kayaking orientation the next morning. We use the kayaks to access snorkel spots that are too far to swim to. We snorkel every day, the snorkeling is incredible. Sometimes the weather doesn’t cooperate, and even though you thought you would be kitesurfing the whole time, the wind might not blow the whole week. There is no telling what will actually happen weather-wise the week you are there. We do not repeat the snorkel or the sea kayak orientations, which is why they are required. 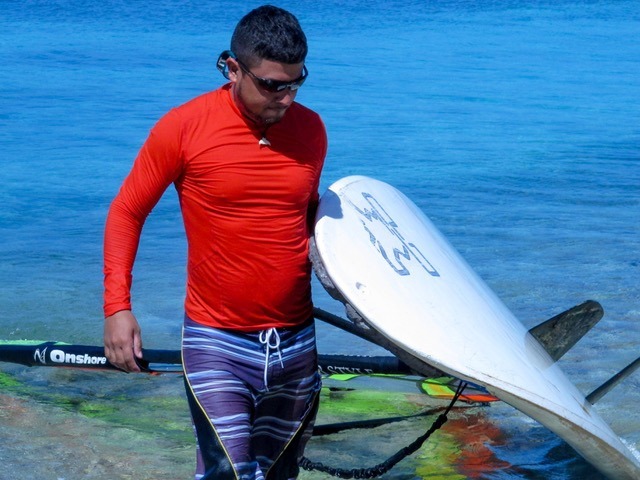 After they are out of the way, the other orientations like windsurfing, kitesurfing, and paddleboarding are offered as many times as people want them. Everyone tells us they didn’t understand the importance of these orientation sessions before they got to the island, but once they spent time there they realized the beauty of our system. It takes time to introduce this much gear to a group so that they can use it with or without a guide safely. How are the days on the island organized? Are activities set on specific days or is there flexibility? The itinerary is more structured at the beginning and completely flexible by the end of the week. No one is required to participate in any sport, but if you want to try a sport you must first attend an orientation/safety session, regardless of your past experience. So the first 24 hours on the island is busy while we complete the mandatory orientations so everyone can get started having fun! Snorkel orientation is the first afternoon, then sea kayak orientation is the next morning. Those we do not repeat. After that, remaining orientations will be repeated as many times as necessary. You may join a guided activity or go off on your own as long as you have a buddy and as long as you have already attended the orientation session. We do reserve the right to veto a plan we feel is unwise.